A Leisure Buddy is a person interested in Leisure and Sport who can accompany you to your chosen activity. They can assist you to get involved to the level you aspire to. They also work with the organisers of your activity to assist them to serve you appropriately, and to make their facilities accessible. Our buddies are trained to assist you to achieve remarkable results. You can use Individualised funding, respite or any other fund you have to purchase Leisure Buddy hours. Leisure buddies are here to assist you to get involved in what-ever leisure, sport and recreation activity you want to participate in (as long as it’s legal). You may just need some assistance to connect with the right people, or you may want more intensive ongoing personal support. Our leisure buddies are able to assist you to plan for the future, and to develop the knowledge and skills you need to enjoy the benefits of being actively involved in the community. We regularly run a full basketball competition where you can join a team and compete in the Geraldton Amateur Basketball Association alongside the rest of the basketball community. The competition runs in line with the regular basketball seasons of the association. Our Leisure Buddies are able to assist you to join and participate in an existing team or you can start a new one and join in with your friends. We regularly hire out the basketball wheelchairs for all sorts of events and training and education activities. You can either just hire the chairs or we can provide coaching and education sessions tailored to your requirements. Come and talk to us about your ideas and we can develop a package to bring them to life. We can assist you with organisational development as well. You can run team building events, leadership development, and novelty sports programs. ATLAS regularly runs all sorts of projects to assist the community to learn about, improve and develop accessible and inclusive facilities and events. ATLAS also conduct customised training and education courses to assist people to advocate for improvements to access and inclusion in the community. Call us to discuss your interest area and specific education and awareness training needs. Are you planning or running an event? Make sure everyone in the community is able to fully enjoy it, including people with mobility requirements. Just contact us or fill in the form by clicking the Request for Quote button below and we will follow up with you to make sure your event is a roaring success with everyone. This equipment is made possible by the State Government’s Royalties for Regions Community Chest Fund and the Mid West Development Commission. If you are looking for a stage to hire why not talk to Pollinators? City of Geraldton have a range of Event Planning resources that will be helpful too. 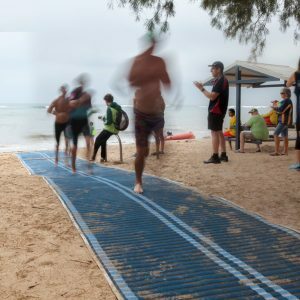 ATLAS is the Western Australian distributor for Mobi-Mat (Beach Matting) and Mobi-Chair (Beach Wheelchairs). Click on the Contact button in the grey strip at the top of the page and we will be pleased to assist you. Push Mobility also have a wide range of equipment and supplies that may be of interest to you. Check out their web site. Are you keen to have a recreational cycle around Geraldton with your friends and family? 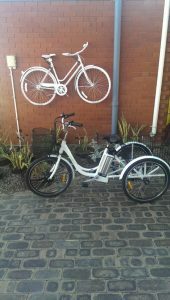 ATLAS has a range of adaptive cycles for hire that you can choose from at Revolutions Geraldton. Just drop in and talk to Paul about your requirements. He is knowledgeable and easy to talk to. to further our mission of inclusion and participation in our community. If you are interested in partnering with ATLAS to create more inclusive opportunities please contact us. REVOLUTIONS Geraldton– Offering handcycles, accessible trikes, and accessible cargo bike for hire. GERALDTON BOXING CENTRE– inclusive and welcoming boxing classes and coaching designed to facilitate full inclusion. GERALDTON SPORTING ABORIGINAL CORPORATION – partnership approach to program design creating accessible, inclusive and culturally safe services and support in our community. 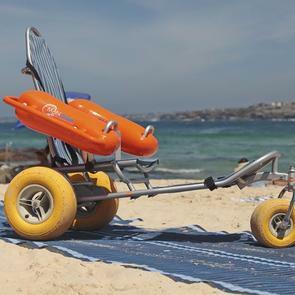 PUSH MOBILITY– is a disability equipment provider in Australia dedicated to providing disability equipment that is fun, exciting and pushes the boundaries of what disability equipment should be. Do you have a short term vacancy or an incomplete shift team? Talk to us by clicking on the Contact button in the grey strip at the top of this page. Our labour hire service is designed to take the emergency out of your rostering and allow you to continue providing excellent client focused services. We can respond at short notice and we work with you to make sure you get the right person to fit your team. You can have one of our team members fill a single shift for a few hours, or for as long and as regularly as you require. We can also provide event, skeleton, and back fill staff. Atlas specialise in community and human service work. We understand the difference good staff make to quality service provision. All of our staff have Police Clearances, Working with Children Checks and are involved in ATLAS’s ongoing training regime. Many have qualifications that will add to your positive organisational reputation. We take the hassle out of recruitment and performance management for you. All of our workers are selected and supported to be their best for you by our Management team. Get in touch with us and we will provide you with all the info you need to get involved.